Spring is in the air. The flowers are beginning to bloom, the water is warming up and it is just about time to get your Sea-Doo back out on the water. 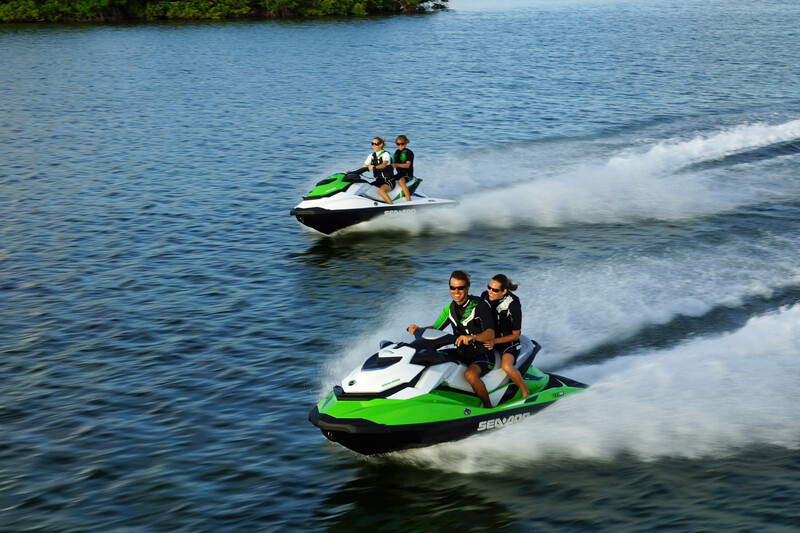 As you get prepared for that first ride, there are a few things you can do to your Sea-Doo personal watercraft to ensure optimum performance on the water. If you winterized your watercraft you should be able to quickly get out on the water with minimal preparation. If you live in a warmer climate, or did not fully winterize your watercraft, we recommend following these steps before hitting the water. •Inspect all fuel and water lines for cracks or damage. Replace or visit your local Sea-Doo dealer to have replaced. •Check all electrical connections for damage or build up. Repair or clean before starting watercraft for the first time. •If you did not change the oil and oil filter before winterizing, be sure to change it during the de-winterizing process. •Check and change your spark plugs if necessary. There is the possibility they developed residue or moisture over the winter. •Make sure your battery has been properly charged and reinstall the battery into your Sea-Doo watercraft. •Check all controls (steering, steering cable, throttle, throttle cable and iBR, lever) for proper movement to ensure they don’t stick. Lubricate any of these controls if they do not move freely. •Connect your Sea-Doo watercraft up to the hose, start the engine and run for no longer then two minutes, this will ensure everything is running properly. •Also it is never a bad thing to clean and detail your Sea-Doo watercraft before the season. This steps helps to prevent sun damage and contaminates in the water while also providing that show room sparkle all season long. Do you have any additional steps that you take prior to hitting the water for that first big ride of the season? If so, please share them with us. We have a 2001 Islandia 22 foot deck boat with 240 hp merc drive. We have been told we cannot start the motor out of the water— Is this true? Even with the hose connection we cannot start the boat in the driveway without damaging the drive?